This pop-over is used to set up an optional grid pattern on map adornments. Columns. The desired number of grid columns. Stored in $GridColumns. colour controls. Sets the colour used to draw the grid and its optional labelsStored $GridColor. Opacity. Controls the opacity used to drawn the grid. Stored $GridOpacity. font control. Sets the font used to draw grid labels. 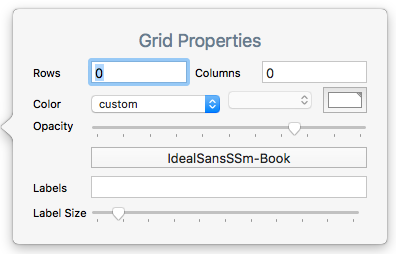 Stored $GridFont. Labels. A list-type list of row and column labels. The Stored $GridLabels. Label size. Sets the (point) size at which labels are drawn. Stored $GridLabelSize. Labels are drawn, centred, at the bottom of each grid cell. Labels are read by row, then column. Thus in a 2-row 3-column grid, the first 3 labels in the list are the labels for all 3 columns of row #1, and so on. By entering an empty list item using 2 consecutive semi-colons in the list, i.e. ';;', specific cells may be left un-labelled. If only rows or columns are set and the other value is left at zero a single row or column is drawn, i.e. a value of 1 is assumed and drawn though not set in the relevant attribute (which remains at '0').